Jumbo Shrimp sautéed with tasso, herbs and spices, served over creamy stone-ground grits. Fresh Lump Louisiana crab cakes with homemade remoulade sauce. Jumbo Lump crabmeat blended with veggies and crab reduction topped with a blend of cheeses. Jumbo Shrimp boiled to perfection, accompanied with our homemade cocktail sauce. Lightly fried calamari dressed with homemade Thai chili glaze. Grilled marinated quail over creamy stone-ground grits with a Leon’s BBQ sauce and fresh berry reduction. Gulf Blue crab served with our homemade cocktail and remoulade. Chilled wedge of iceberg, heirloom cherry tomatoes, shredded carrots, apple wood smoked bacon bits, and green onions. Served with your choice of homemade dressing. Crispy hearts of chopped artisan romaine with homemade caesar dressing, accompanied with shaved parmesan cheese, apple wood smoked bacon bits, red onion, roasted corn and homemade croutons. Blend of greens tossed with 2Johns remoulade dressing with crispy fried green tomatoes and feta cheese. Fresh spinach dressed with a warm bacon dressing accompanied with red onions, sliced hard-boiled egg and apple wood smoked bacon bits. Mixed greens dressed with an apple cider and honey vinaigrette, roasted butternut squash, toasted pecans, dried cranberries, and blue cheese crumbles. A Louisiana favorite. Homemade shrimp stock combined with vegetables and cream with a touch of sherry to finish. Hand-cut tenderloin cooked to desired temperature, served with whipped red potatoes and haricots verts. A 2Johns Signature Dish 7oz.or 10oz. 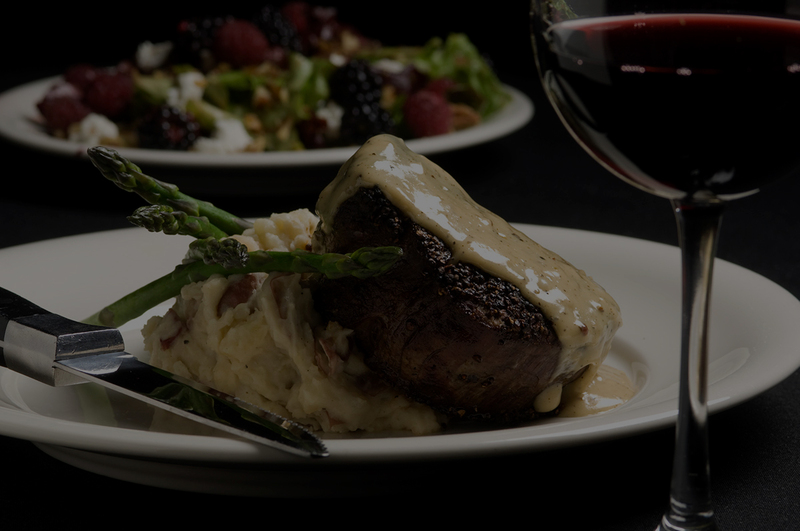 filet, pepper-crusted and served with whipped red potatoes, haricots verts, and cognac-peppercorn cream sauce. Airline cut of chicken breast, seared with special blend of spices, white wine and a twist of lime. Roasted through to finish. Served with whipped red potatoes and sautéed spinach. Broiled and topped with a balsamic reduction. Served with sweet potatoes and haricots verts. Linguine pasta tossed in a garlic butter wine sauce, finished with spinach, Parmesan, and red pepper flakes. Served with your choice of sautéed shrimp or grilled chicken. Jumbo shrimp fried or grilled, served with whipped red potatoes. Cast iron blackened salmon, topped with a strawberry and mango chutney and served with whipped red potatoes and sautéed spinach. Pan fried rainbow trout topped with a lemon, parsley, and brown butter sauce. Served with whipped red potatoes and haricots verts. Pan seared Gulf grouper over lobster creamed spinach. Blackened Gulf Red Snapper over whipped red potatoes, topped with a crawfish, crab, and shrimp Creole sauce. Served with haricots verts..